I just recently got a copy of the Greyston Bakery Cookbook , and as I read through the cakes chapter, I started mentally assigning each cake to a future occasion. The Mexican hot chocolate cake might be good for New Year’s, the steamed lemon cakelets would be lovely in the spring, maybe we should have the mocha kahlua cake on Christmas Eve, I want the fresh coconut mousse cake for my birthday, and the Bermudian rum cake would be great for next Monday because no other occasion was soon enough. After the cakes come the tarts which are followed by the cookies and bars. Since I wasn’t willing to wait for a special occasion to get baking, I decided to start with the oatmeal maple bars. All of these recipes come from the Greyston Bakery in Yonkers, New York which employs people from the community who may have previously had a hard time finding a stable job. Their made from scratch sweets are sold at the bakery, on the bakery’s web site and at shops and restaurants in New York City. There is much more information about the social mission of the bakery and the Greyston Foundation on their web site. I’ve never visited the bakery, but I had heard a lot about it, and the book came highly recommended. As I wrote down a shopping list of ingredients for these bars, I kept flipping back to the page with the lime bars with white chocolate. In the end though, I chose to welcome the fall season with the flavors of oatmeal and maple. The bars are a mixture of oats, butter, sugar, pure maple syrup, eggs, vanilla, grated orange zest, raisins, and walnuts. The raisins were supposed to be currants, but for whatever reason, Whole Foods had no currants and I was too lazy to make another stop. The raisins were fine here, and the important thing was actually the orange zest. It definitely should not be skipped. The bars were baked in a nine-inch by thirteen-inch pan and then were left to cool. Once cool, a glaze made from butter, maple syrup, cream, and confectioner’s sugar was to have been drizzled on top. The photo in the book shows a nice, thick glaze that was drawn across the bars in lines. My glaze, however, was not of such a consistency. I tried letting it cool for extra time in hopes it would thicken. I tried whisking in a little more confectioner’s sugar. And, then, I gave up and just poured the thin glaze all over the top of the uncut bars and placed walnut halves in what would be the centers of each of 24 pieces. My glaze may not have looked liked that in the photo, but it was delicious. The chewy, bars are an addictive flavor combination of orange, walnut, oats, and a hint of maple while the glaze adds more maple flavor on top. Cut into cute, little squares, these are hard to resist. Now, I’m starting to think those cakes don’t really need to be reserved for special occasions, and even if they do, I should probably test them first anyway, right? My mouth was watering as I read your post...the rum cake, the Mexican choc cake for New years eve.......I have never heard of this bakery, but will buy the book right now! Just what I need, another cookbook and a piece of cake! that ganache sounds heavenly. and i especially like why you're having the rum cake. mondays should ALWAYS come with cakes! Great choice to help bring in the fall. Oatmeal and maple do pair well together. Got anymore? I haven't had dessert yet. What an inspirational bakery! 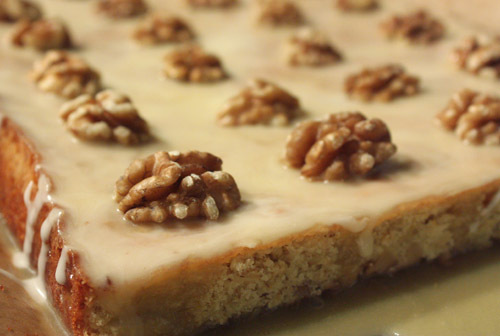 Your bars sound delicious and I love the walnuts on top - so pretty! Wow, what a nice bars...the picture is so tempting...feel like almost digging through the screen...yummie! What a delicious bars Lisa. Love the icing! I love that book and don't use it nearly enough. Everything I have made has turned out really well. These look terrific! O no, you definitely shouldn't be reserving that only for special occasions! Isn't everyday a bit of special occasion anyway? :) Those looks absolutely delicious! So you've got yourself another cookbook :D! I love buying cookbooks too. The maple syrup glaze looks heavenly! This bar makes a great tea time treat! Those bars look really good! What an awesome treat! oooh delicious! my sister brought me back some maple syrup from canada not long ago and I've been wondering what to make with it to do it justice - I think this may be it!! i'd definitely make this for a special occasion. is wednesday a special occasion? what a glorious bar--i don't think maple syrup is used often enough. Lovely glaze and they just look so adorable when you cut them to little squares! I don't even have to try these to know that I'd just adore them (although could you possibly arrange to send me a slice? ;) ). Oh Lisa, these look and sound so incredible. I haven't even had breakfast yet and my mouth is watering. The way you describe that book has made me want to search it out. YUM!! I think adding orange zest to baked goods is one of the best ideas ever! I usually add it to brownies. Your pasta post is reminding me to take my pasta machine out of the box. These are so Autumny and I love the flavors. They look and sound simply scrumptious! The glaze is perfect! These are just perfect for fall! I want a piece for breakfast w/ my tea! I am so drooling. What deliciousness! Perfect autumn treat, what with all those warm flavours. With those delightful recipes in hand, you have a fine year ahead of you, my dear. Glistening in maple glaze and tangy with citrus, these bars are just my type. They look perfect and although we don't get maple syrup in Greece I can imagine how wonderful they tasted. Sound perfect for this time of year! I'm going to make these to add to my Christmas cookie platter. These are the perfect fall treat! What wonderful flavors to pair together. The book sounds great! Now that's a cake that would be perfect for any occasion! I love maple syrup in anything but this looks like a perfect recipe. I love maple! These look so moist and yummy! 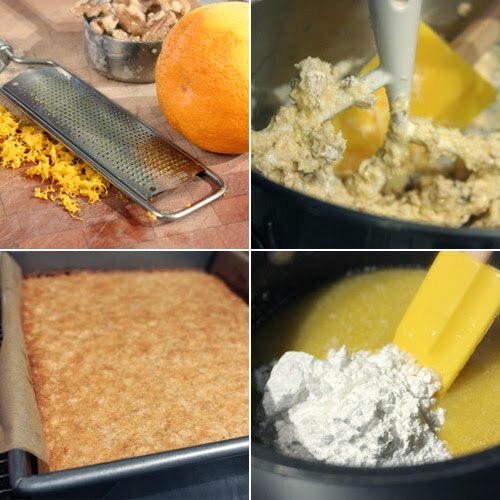 I love the combination of the raisins and the orange zest with the maple. I'll be making these soon. Bookmarking in my delicious cookbook now! I am a maple nut so these just look fantastic! Oh my, these goodies look amazing and sure to get be in deep trouble. OMG! Those maple bars are stunning! If only I could bake :-) A perfect treat for the autumn season. Oh, these look delicious, and I'm not even much of a sweets person. 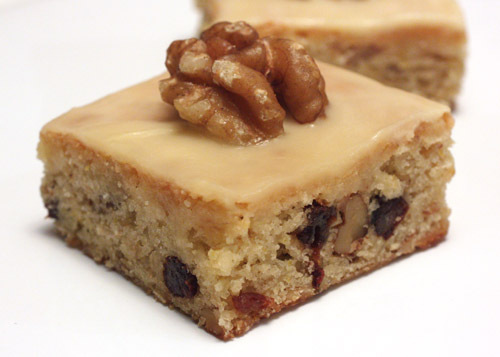 The maple flavor sounds terrific for these delicious looking bars! Anonymous: I understand that a lot of bloggers do post recipes and when they are adapted that is perfectly legal and allowable. I often prepare many recipes from the same book and without permission from the publisher, I would not want to give away that much content. It's a choice I've made to be sure I'm not overstepping any bounds of copyright protection. When I do change a recipe significantly or when a book is out of print, I include the recipe in the post. Oh wow! When I saw these, I gasped! These are absolutely gorgeous! Good point about the Copyright Protection. Though the lime bars would've been tasty too, I'm glad you went with these. They sound ideal for fall, I'd gobble them up with some hot tea! These look like they'd be delicious warm, right outta the oven! All those cakes sound delicious and these bars look full of flavor. love the photographs and the mission of Greyston bakery. Lisa, when I die, I want to come back as a maple dessert like this :) I find people either hate it or love it, and I am a lover! What a great looking bar! I can't wait to make them. Lisa, I can't take my eyes from the picture on the top. It looks gorgeous! Beautiful, and I don't know how many times I've substituted because making that extra stop seems just too much. I've made some unexpected but tasty things because of it though! Nice comment on Copyright - I agree. Yum, this looks delicious...and beautiful, reminds me of the only donut I ate as a kid- maple with chopped nuts. Makes me want to go out and have another and let my 2 yo try his first donut! This looks much much better of course!